In Europe, you have many reliable methods of transportation from which to choose and each has its pros and cons. You can travel by plane, bus, car, or train. 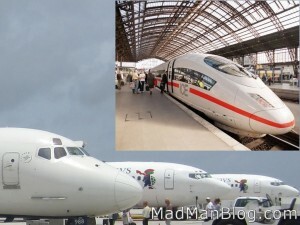 Here, I want to tell you why I chose to take an 8.5 hour train ride to get from Cologne, Germany to Vienna, Austria instead of taking a 1 hour plane ride. First, remember that trains in Europe, particularly Germany, are significantly better than anything offered in the U.S. The trains are on-time, clean, comfortable, fast, on-time, filled with friendly staff, and did I mention on-time. The ICE trains in Germany, which I am currently sitting in while writing this, also have electrical outlets for every row of seats in first and second class. Now, back to why I’m taking a train to Vienna. For starters, I HATE airport security; it is not as bad in Europe as it is in the U.S. in that I don’t have someone grabbing my balls or shooting me with radiation, but it is still annoying. With trains, you only have to arrive a few minutes before departure instead of a couple hours; it is much easier to get to a main train station rather than the airport; there are no lines to check-in or lines for security, which usually doesn’t exist; and the train will usually drop you off right at your destination or in the middle of your destination city. In effect, when comparing trains and planes, remember to add 3-6 hours of extra travel time for the plane when you add in all of these factors (wholly dependent on the airports being used of course). After that, I enjoy taking the train because I can get up, move around, go to the dining car if I like, recline my chair, etc. There are even foot rests on the ICE train and the seats recline so far that you can quite comfortably sleep. However, it does take a lot longer than flying, at least for this trip. I’m ok with that though because I just plug-in my computer and do whatever I want. I just finished watching two movies – Batman Returns and Brave Heart – and I wrote 8 articles for this blog. I find it hard to get a lot of time to myself where I can do some work, write some articles, and generally relax and this train ride allows me to do all of those things. Plane equals stress and train equals relaxation.